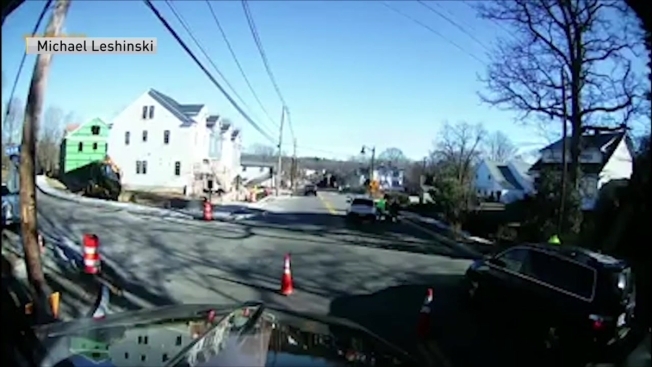 Authorities are investigating after a driver hit a Massachusetts police officer working a road construction detail on Wednesday. Medway police said the incident happened just after 10 a.m. on Wednesday at the intersection of Main and Mechanic streets. The officer, identified as Medway Special Police Officer Richard Malo, was taken to Milford Regional Hospital with non-life-threatening injuries. His current condition is not known. Video from the scene, which has garnered more than 50,000 views after it was posted to Facebook, shows Guthro's vehicle taking a left turn onto Main Street before hitting Melo. Crew members in the area then rushed over to Melo's side as Guthro stopped his vehicle. The driver, identified as Jerome Guthro, 71, of Medway, stopped at the scene and is cooperating with the investigation, according police. It's unclear if charges have been filed.